If you’re looking for wholesale ice cream to sell in your store, we think you should consider something a little different than the norm. Ice cream is such a well-loved and solid choice for stores all over the United States, but we offer something slightly different. Mochi ice cream is the same cold, creamy treat you know and love—served in a fun and unique way. Whether you’ve tried this famous Japanese dessert or not, here are 4 great reasons why you should consider adding something new to your store’s frozen food inventory. 1. My/Mo, the original brand of Mochi ice cream, has been loved by people of all ages for decades. My/Mo was the original creator of Mochi ice cream—specializing in fine Japanese desserts and pastries since 1910. In the 1990s, we decided to take our famed Mochi dough and wrap it around sweet, creamy ice cream for the perfect frozen treat. Today, you can find this special treat in stores all over the U.S. Available in local grocers and nationwide chains, alike, the demand for Mochi ice cream is already high. Why not cash in on that demand and offer Mochi ice cream in your own store? 2. You’ll keep your customers happy by offering something fun and different. In today’s society, consumers are always looking for something new, fun, and different from the norm. Sure, there will always be a need for gallons or pints of ice cream. But consumers also value having a choice. Give them the option to enjoy ice cream on its own or in a new-and-improved way in the form of Mochi ice cream. 3. 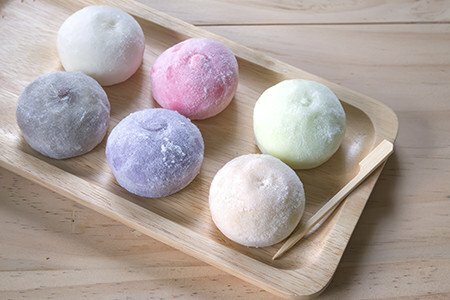 You can find wholesale mochi ice cream in so many traditional and unusual flavors. No matter what brand you go with, ice cream traditionally comes in a lot of the same flavors: Vanilla, Chocolate, Strawberry, Cookies n’ Cream, Coffee, Mint Chip, etc… And while these flavors will never go out of style, we love the variety you get by offering Mochi flavors in your store. Whether it’s Plum Wine, Red Bean, Black Sesame, or Green Tea Matcha, these flavors are sure to catch the attention (and taste buds!) of your customers. 4. Mochi ice cream makes it easy to offer samples to customers. Store owners know that offering samples is a great way to introduce something new or special to your customers. Traditional ice cream is a little difficult to sample, as it requires scooping and portioning in order to serve it to individual people. Mochi ice cream already comes pre-portioned in bite-size pieces. All you have to do is open the package, and they’re ready to serve! Interested in becoming a retailer of Mochi ice cream? We’d love to give you more information on stocking up. Click below to submit your store information to us, and we’ll be in touch on the steps to take to become an authorized retailer.